This fascinating new book reflects the results of the turmoil and change in the religions of America since Leo Rosten first wrote about them. 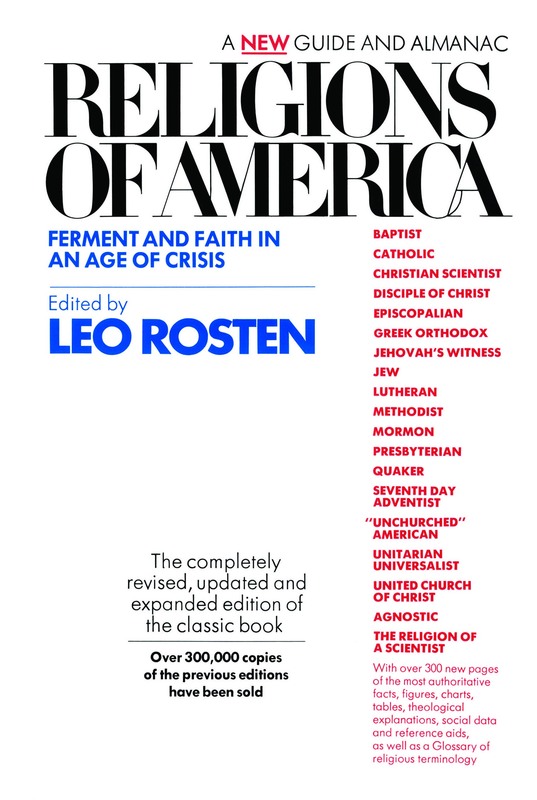 Those familiar with Leo Rosten's A Guide to the Religions of America (1955) and his Religions in America (1963) need not be told of the extraordinary reception both volumes received from the reviewers and the public. They were acclaimed by theologians of all faiths. Each book sold hundreds of thousands of copies. But this new Religions of America renders those two volumes entirely out of date. There is no other book even remotely comparable to it. NOTE TO THE READER: The original text of "What Is a Baptist?" was written by the late William B. Lipphard. Many new answers (to new or old questions) have been supplied for this new, revised edition by Dr. Frank A. Sharp. Wherever the text has been supplied by Dr. Sharp, his initials appear in brackets. WILLIAM B. LIPPHARD / Mr. Lipphard wrote from an editorial background of nearly fifty years of professional association with the American Baptist Convention, which consists of over 6,500 churches. He was president of the Associated Church Press from 1947 to 1949 and served for ten years as its executive secretary. He was for twenty years editor of the Baptist publication Missions Magazine and served as a delegate to Baptist World Congresses in Sweden, Canada, Germany, the United States, Denmark, and England. Mr. Lipphard was born in Evansville, Indiana, and was educated at Yale University, from which he received a B.A. and M.A., and at Colgate-Rochester Divinity School, where he earned his B.D. From 1940 to 1943, Mr. Lipphard was secretary of the World Relief Committee of the American Baptist Convention. He was a member of the Joint Commission on Missionary Education of the National Council of Churches of Christ and a member of the American Friends of the World Council of Churches and the Foreign Policy Association. Mr. Lipphard received an award from the Associated Church Press for eminence in editorial writing. He served as director of the Church Press at the 1954 second assembly of the World Council of Churches at Evanston, Illinois. He died in 1971. FRANK A. SHARP / The Reverend Frank A. Sharp is director of the Department of Public Interpretation of the American Baptist Churches (Valley Forge, Pennsylvania). His weekly column in the American Baptist News Service is widely distributed throughout the United States. A graduate of Colgate and the Colgate-Rochester Divinity School, he received his Ph.D. from the University of Pittsburgh in 1948 and served as pastor of several Baptist churches. Dr. Sharp has traveled widely as a representative to, and reporter on, many Baptist and interdenominational conventions -- in Europe and Latin America. In 1966 he attended the World Conference on Church and Society in Geneva; in 1968, the Fourth General Assembly of the World Council of Churches in Uppsala, Sweden; in 1970, the Baptist World Alliance Congress in Tokyo. His writings have appeared in many journals on religion, including Christian Century, Churchman, and International Journal of Religious Education. Baptists have never adopted one of the historic Christian creeds -- because Baptists have been dedicated to a high degree of personal independence and to the right of the individual to interpret the New Testament for himself in matters of faith and practice. It is difficult, therefore, to present one fixed set of criteria by which to characterize a Baptist. Among Baptists, there is a great deal of diversity because of their insistence on purity, on personal responsibility, and on freedom of belief and worship. 1. Belief in the supremacy of the Scriptures, rather than in the church or a hierarchy. 2. Belief in religious liberty, in the freedom to worship without any compulsion from or by the state. 3. Belief in the baptism of believers, rather than the baptism of infants. Is There Then No Baptist Hierarchy or Central Authority? Baptists have no hierarchy, no centralized control of religious activity, no headquarters that conduct an "oversight" of churches -- or liturgies, practices, or regulations. The local Baptist parish church is a law unto itself. Its relations with other Baptist churches, its compliance with recommendations from national church headquarters, its acceptance of any resolutions formulated at regional, national, or international conventions -- all these are entirely voluntary on the part of the parish church, without the slightest degree of compulsion from any central or national or international body. Indeed, Baptists are more properly called a denomination, not a church. Why Do Baptists Call Themselves a Denomination Instead of a Church? Most Baptists do not believe that they constitute a "church" because they are organized into independent, local "churches." The local parish church is the sovereign, all-powerful ecclesiastical unit. The term "Baptist Church" is used for convenience; "denomination" is preferred by most Baptists. In fact, a recent attempt to change the name to "American Baptist Church" was discarded in favor of the name "American Baptist Churches in the U.S.A."
Can Any Group of Believers in the Baptist Faith Form a Congregation or Church? A Baptist congregation needs no specific chain of historical events in order to be a true church. Any group of dedicated, regenerated, Bible-oriented people can form a Baptist church that can be an authentic part of the Body of Christ. Do Baptists Accept the Literal Interpretation of the Bible? All Baptists believe in the inspiration of the Bible and accept the Bible as infallible in religious teachings: as a trustworthy record of the progressive revelation of God, climaxed by the supreme revelation of Himself in Jesus Christ. "Progressive" and "liberal" Baptists regard some sections of the Bible as written in the thought patterns of Biblical times -- that is, as allegorical, figurative, and legendary yet conveying eternal religious truths. "Fundamentalist" or "extreme" Baptists accept the Bible literally, regarding it as infallible and final in every detail. But no official dogma prescribes how any individual Baptist shall interpret the Bible. No. What are known as sacraments are regarded by Baptists as simple, dignified ordinances with no supernatural significance and no sacramental value. But Do Not Baptists Observe the Communion Service, or the Lord's Supper? The Lord's Supper, or communion service, is usually observed on the first Sunday of the month. It is a reminder of the death of Christ and is observed in obedience to His command to commemorate the Supper on the night before He was crucified. But whatever grace a Baptist derives from participating in the Lord's Supper depends on his own awareness of what the Supper signifies as a memorial service. No grace is supernaturally bequeathed to him -- neither by the officiating clergyman nor by partaking of the bread and of the cup. Whatever blessing a Baptist receives comes through some new rededication, by him, in the communion service to a life of righteousness and service to his fellow men. Why Do Baptists Baptize Only by Immersion? 1. Immersion is the mode of baptism described in the New Testament; John the Baptist immersed his converts in the Jordan River; Christ Himself was so immersed. 2. Baptists regard baptism as a public confession of Christian faith and as a symbol of the burial and resurrection of Christ, as stated by Paul in his Epistle to the Colossians. Hence, Baptists look upon immersion as realistic symbolism, through which the life of sin is buried in baptism and the new life of faith emerges. Incidentally, "baptize" is a transliteration (not a translation) of the Greek word baptizein, meaning "to immerse." Therefore, to say that Baptists "baptize by immersion" is redundant; baptism originally was immersion. Why Don't Baptists Baptize Infants? Baptism is a voluntary public profession of Christian faith; therefore, Baptists believe, only persons old enough to understand its significance and its symbolism should be accepted for baptism. Baptists give their children the right to decide for themselves whether or not they wish to be baptized as a public profession of Christian faith. We believe that such a decision makes the ceremony of baptism, and religion itself, more meaningful. Is Baptism Mandatory for All Baptists? There are differences of opinion among Baptists in regard to baptism. Some churches limit their membership to immersed believers only (closed membership); other churches admit members by letter from other Christian bodies -- but limit the right to vote on certain issues (associate membership); and still other churches admit members on their profession of faith, leaving the question of baptism to the conscience of the believer (open membership). There are also some Baptists who refuse to regard baptism as valid and call it "alien baptism" if it is or was administered by any other than a New Testament church, which is usually interpreted as being a Baptist church of like mind and theology. Do Baptists Accept the Doctrine of the Virgin Birth of Christ? A great majority undoubtedly do. A substantial minority do not. For the majority, the doctrine of the Virgin Birth is essential to faith in the deity of Christ. The minority need no such support, since they find no reference to the Virgin Birth in the writings of Paul or in the Gospels of Mark and John. Baptists pay no special homage to Mary but respect her as the noblest of women. They have never accepted the doctrine of her immaculate conception or the doctrine, announced in 1950 by Pope Plus XII, of the Assumption of Mary. Since Baptists have no authoritarian creed to control their faith and practice, each local parish church has the right to decide whether or not to make acceptance of the doctrine of the Virgin Birth a condition of church membership. Do Baptists Accept the Doctrine of the Trinity? This is a basic doctrine of Christianity. The trinitarian formula, "in the name of the Father, and of the Son, and of the Holy Ghost," is used at every baptism. The sublime mystery of the Trinity, of the eternal and infinite essence of God manifested in three persons -- these, the Baptist leaves to theologians to interpret. He accepts them. What Do Baptists Believe About Sin and Salvation? Baptists believe that every true believer in Christ as personal Savior is saved -- without the intervention of preacher or church. The confession of sin is a personal matter between the individual and God. Do Baptists Believe in Heaven and Hell? Most Baptists believe in some form of life beyond the grave. Ideas range from a nebulous, indefinable existence to a definite place, like a city of golden streets or a region of everlasting torment. Do Baptists Approve of Divorce? No, except when there has been adultery. But there is no regulation among Baptist churches regarding divorce. Annual conventions of Baptists have often condemned the rising divorce rate in the United States. Each Baptist clergyman depends on his conscience in deciding whether or not to officiate at the marriage of divorced persons. No church law prescribes what he must do. What Is the Baptist Attitude Toward Black People? Failure of the white-dominated society to respect and rely on the voice of the poor citizens, and especially poor black men, in decisions affecting their welfare in white-owned, white-dominated and white-maintained ghettos. Develop and support opportunities for all, especially the minority group poor, to participate in decisions by religious, governmental, industrial, commercial, welfare and other institutions affecting their lives. What Is the Status/Role of Women Among Baptists? 1. Reverse the declining number of positions held by professionally trained women in local churches, states, cities, and regional and national staffs. 2. Establish policies and practices in electing and appointing persons to offices, committees, and boards to ensure more adequate opportunities for women. Do Baptists Sanction Birth Control? No parish Baptist church and no ecclesiastical convention of Baptists has ever by resolution expressed approval or disapproval of birth control or planned parenthood. Even if it had, such resolution would not be binding on any Baptist. Most Baptists would resent and repudiate any such resolution as an unwarranted intrusion into the private life of husband and wife. What Is the Baptist Attitude Toward Abortion? There is no official or single stand. Every Baptist is free to make up his own mind. With reference to abortion, the American Baptist Churches meeting in Boston, in 1968, passed a resolution asking that the termination of a pregnancy, prior to the end of the twelfth week of pregnancy, be at the request of the individual or individuals concerned and be regarded as an elective medical procedure, governed by the laws regulating medical practice and licensure. What Is the Baptist Attitude Toward Homosexuality? Again, there is no official, single position. How Do Baptists Propagate Their Faith? The historic Baptist view holds that every church member and every professing Christian is an evangelist. By word, deed, and character, he is committed to proclaim his Christian faith and to seek to win others to its acceptance. Throughout their history, Baptists have engaged in very active missionary effort, at home and abroad. Baptist foreign missions have been successful on every continent. Do Baptists Cooperate in the Ecumenical Movement? Out of twenty-seven Baptist bodies in the United States, only ten belong to the Baptist World Alliance and five belong to the National Council of Churches. Out of 115 Baptist groups around the world, ten are members of the World Council of Churches. But there are some notable exceptions. The American Baptist Convention has been a part of the ecumenical movement from its inception. Baptists were active in the formation of the American Bible Society (1816), the American Sunday School Union (1824), the Federal Council of Churches (1908), and the National and World Council of Churches. Are Baptists Active in Social Issues? Once again, because of their sense of independence and their conservative outlook, most Baptists are inclined to emphasize the responsibility to evangelize individuals, in the hope that the individuals will in turn change society. A few Baptists attempt to apply Christian principles to the political and social issues of the day. Some Baptists would attempt to do both, seeing evangelism as the total witness of the Christian to all of his relationships in society. How Many Baptists Are There? Baptists (as a family of denominations) constitute the largest Protestant group in the United States. The World Almanac for 1974 lists 21 different Baptist bodies with a total membership of 26,315,235. The largest single Baptist body in the United States is the Southern Baptist Convention: 34,441 churches, with 11,826,463 members. The fourth largest Baptist denomination in the United States is the American Baptist Convention, with 6,090 churches and a membership of approximately 1,472,478. A full list of Baptists in the United States would also include many less commonly known groups, such as the General Six Principle Baptists, the Primitive Baptists, the Two-Seed-in-the-Spirit Predestinarian Baptists, the Duck River and Kindred Associations of Baptists, Free Will Baptists, Seventh Day Baptist General Conference -- as well as Baptist groups established by immigrants from European countries -- from Sweden, Germany, Norway, and Italy, for example. According to the 1972 statistics released by the Baptist World Alliance there are Baptists in 115 countries around the world. One of the largest Baptist bodies outside the United States is located in the USSR (about 550,000). Next in size are Baptists of Zaire, Africa, with 450,000 members, and Britain, with a membership of 215,000. Where Did the Baptist Movement Begin? Because of the independent character of Baptists, they are related to, and were a part of, the same spirit that brought about the Reformation -- although Baptists are not directly related to Luther, Calvin, Zwingli, or Knox, the great reformers. Baptists are spiritually related to those who wanted freedom from the established church: freedom to read and interpret the Scriptures according to the leading of the Holy Spirit, freedom from government interference, and freedom to hold a strong belief in an adult believer's baptism as opposed to infant baptism. Most historians would place the historical roots of Baptists in England, growing out of the Puritan and Separatist movements. The early Baptists were those who wanted to reform, or who withdrew from, the established church in England, whether it was Roman Catholic or the Church of England. In 1602, John Smyth, an Anglican preacher, renounced the episcopacy while speaking at Lincoln Cathedral. He was removed by the church authorities and became pastor of a small group of Separatists. This congregation, along with some others, moved to Holland in 1606. Smyth's convictions led him to the conclusion that a church did not have to be part of a historical succession and that its membership should be composed only of those who had repented of their sins, had confessed their faith in Jesus Christ, and were baptized. When Did Baptists Originate in the United States? When New England was settled by the English, they brought with them the same religious affiliations as they had had back home: There were Puritans, Pilgrims, Separatists, Congregationalists, and a few Baptists. To this day there is an argument whether the Newport Church of Rhode Island or the Providence Church was the first Baptist church in America. The reason is historically interesting. In 1639, Roger Williams, a young Puritan minister, came to the Massachusetts Bay Colony seeking religious freedom. But the Puritan Congregationalists did not allow freedom of worship, and Williams was expelled by the authorities. In 1636, he founded the colony of Rhode Island -- for the purpose of granting full religious freedom for all. In 1639, in Providence, he founded the First Baptist Church in America. How Do Local Congregations Work Together? Although each local Baptist church is independent, soon after new churches began to spring up in New England and throughout the American colonies, the churches felt the need for mutual guidance and fellowship. So they organized themselves into voluntary groups, known as associations. In 1707, when five congregations formed the Philadelphia Baptist Association, the first association of Baptist churches in America was organized. National Baptist work was also organized on a voluntary basis to support foreign missionary work. In 1814, the Triennial Baptist Convention came into being to support Ann and Adoniram Judson, the first foreign missionaries to leave American shores for service in India and Burma. This organization's descendant is known as the American Baptist Foreign Mission Society. Other cooperative efforts were found to be necessary inasmuch as printed materials were needed to evangelize the Indians and to follow the trek westward on the frontier. In 1824 the General Tract Society was organized (today called the American Baptist Board of Education and Publication). In 1832 the American Baptist Home Mission Society was founded. Until 1845, practically all Baptists belonged to the same national body, the Triennial Convention. When Did Baptists Separate from This Convention? In 1845, a clash over the slavery issue -- and a difference over the organizational structure (independent societies vs. related boards) -- caused the withdrawal of those Southerners who formed the Southern Baptist Convention. Baptists of the North continued to be related to all of the original societies and to the Triennial Convention,until 1907. Because of the need for a single financial appeal to the churches and for a stronger voice to speak out on social issues, the Northern Baptist Convention was created. In 1950, the name was changed to the American Baptist Convention. In 1972, the name was changed to American Baptist Churches in the U.S.A. Copyright &copy; 1975 by Cowles Communications, Inc.